One of the reasons we wanted to come to Calfate was to see the spectacular Glacier Perito Moreno, considered number 8 on the great wonders of the world list. After a bit of investigation into the buses to Perito Moreno we quickly discovered that it had rapidly become a day trip tourist attraction with a strict no camping allowed. The bus ticket combined with entry fee to the park was going to blow our budget by quite a bit… We we’re considering hitch hiking when the owner of the camp ground mentioned that the two motor homes next door to us we’re heading that way the next day and that we should ask them. To be in the presence of the Glacier was truly an amazing experience. Fragments of the glacier crack and fall off into the beautiful milky sky-blue water below creating a indescribable sound. The glacier is one of the few in the world that is constantly growing. As it grows it touches the mountainside and separates the lake in two. With no escape route, the water-level on one side rises above the level of the main lake. There is then a huge amount of pressure produced by the height of the dammed water and it will finally break the ice barrier in a spectacular rupture event. This dam/rupture cycle is not regular and it recurs naturally at any time between once a year to less than once a decade. We unfortunatley we’re not a witness to this, but to just simply be in the presence of this amazing natural phenomenon is something we will never forget. A huge glaciar 30m high and kilometers across. A perfect tourist attraction. El Calafate was not really more than a stopover town for us, a gateway to visiting the amazing Perito Moreno Glacier However we did end up spending three nights here. It it is a bit bigger than El Chalten and a bit less touristy. On the main street there is plenty of the same tourist shops filled with delicious hand made chocolates and crafts, but on the edges of the city are some charming rustic houses. At one place we saw a beautiful scene with a family running around on their horses in the field behind their house, wild flowers everywhere of course. Another highlight was the park on the edge of the town. A bird sanctuary, it is full of different birds, including hundreds of flamingos hanging out in the ponds. 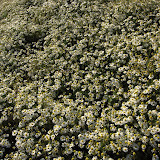 At the particular time of year that we visited however, the grassy marshes were absolutely packed solid with more daisies than you could shake a stick at. Gateway to the very popular Perito Moreno Glaciar. We’ve just learned about the huge earthquake in Chile. For anyone concerned we are currently a long way from that area and so were not affected at all. However, I think it will make the rest of our trip very interesting. Our hearts go out to all those who were not so lucky. At five o clock, an hour before our bus to El Calafate was scheduled to depart we were sitting in the sun getting our stuff organised when we were stumbled upon by Shawn, an American friend from the previous hike. He started telling us about the next hike he was planning, and once he started with his American enthusiasm we really couldn’t argue with the fact that there was still much more to see, and that the weather was being undeniably and uncommonly kind to us and that suddenly we were feeling much more ready to do another slog. So come six o clock, we were hauling our stuff past our waiting bus, and to a trailer at the back of a hostel that was to be our base for the next few days. The trip proposed was much more adventurous than our previous one. It would take a total of about 20 hours of walking and two nights camping. The goal was to reach the campsite at Lago Toro and then push on up the mountains to the Ponta del viente (Pass of wind?) which is the pass through which one must go to reach the Southern Ice fields, which are the top of the massive Glaciar Viedma. Accompanying us on the trip was another of our friends from the previous hike, a Belgian guy called Francois. The first day went really nicely with a long but fairly easy walk across mostly open hills with lovely open views of the surrounding mountains and the huge Lago Viedma. The second day was when things got really adventurous. The first challenge was to cross the icy river that runs down from the glacer above. For most people this is not a problem as there is a cable tyrolean which allows an easy crossing, with the right equipment. For us however, it was a wade barefoot through the numerous knee deep branches of the river that spread out just before meeting the lake. So one after the other we waded through the 10m wide stretches, with breaks after each to curse and temporarily curl into the foetal position. Walking through ice cold water may not sound too bad in theory, but I can tell you it is a painful experience, especially after going through twelve or so stretches. We got across in the end however and after a short climb we hit the next challenge, a glacier. Initially we didn’t walk on the ice, but instead tried to navigate around along a steep slope of delicately piled rocks with sizes ranging from about the size of a football to a small car. This got extremely hairy at some points so we opted to climb down and did the rest of the crossing on the ice itself, which luckily was scattered with small rocks, providing our boots with a bit of traction. At lunch time we had not gone nearly as far as expected and were on the point of calling it a day and returning. But luckily the spirit of adventure prevailed and we continued on, now with a deadline. From there we were on a clear path again and though it wound steeply up the slopes on loose rock, it was not nearly as hazardous as the previous slopes and we made good progress. It is very arid terrain but there are some lovely streams coming down and also some really interesting flowers and plants. We were even able to appreciate the amazing view, but tried not to spend too long looking down the 45 degree slope to our right. And then we were at the pass, bracing ourselves against the powerful gusts of cold wind coming through. The view out over the ice fields was worth it though. Miles and miles of jagged ice stretching out like a frozen ocean, with ice capped mountains beyond. We couldn’t stay too long though, so after a few photos and a play in a patch of snow we set off down the slopes again. With the help of gravity the steep slopes flew past and come to the rocky slopes we took the much safer option (relatively) of crossing the ice. This was a bit hairy too however as there were now some really strong gusts of wind coming down which seemed to be timed to hit us just as we would approach one of the numerous gaping cracks in the ice. Very exciting to be walking on a huge slab of ice as it grinds down a mountain. From there it was one more session of torture crossing the river and then we were back in camp having dinner and a milky sweet hot chocolate. The next day we began our return. However on the way we came across a “shortcut” that would allow us to visit another, apparently spectacular viewpoint, Mirador Pliegue Tumbado, on our way. Sophie was not having a bar of it and decided to stay on the level track and wait while Francois and I diverged from the path. The detour took us over some really interesting, moon-like plains of small, sharp, rock shards. We eventually made it to the top of the viewpoint which was actually higher than our climb the previous day. It offered an amazing 360 degree view of Cerro Torre and Fiz-Roy in front, the huge, milkly-blue Lago Viedma behind and to the left now a long way away and far below, the pass where we’d been the previous day. Then it was a fast march back to El Chalten as the sun sank behind the mountains. The next day we found ourselves waiting for the bus again, and this time we actually got on it. Our desination, El Calafate, home to the huge Perito Moreno Glacier, and probably the last town we will visit before we cross the border into Chile. 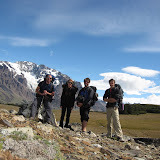 From El Chalten to Laguna Toro, then on to the Pass of Wind, and back. Approaching El Chalten in the bus was spectacular. The sun had just come up, lighting up the the towering jagged granite spires that are the dominating features of the area, and will be featuring in many of the accomapanying photos. The two main features are the Torres, three impossibly tall, narrow spires and Cerro Fitz-Roy, a huge granite hump, flanked by several smaller jagged peaks, all cloaked in snow and ice. Since we arrived so early in the day and had done some shopping in Bariloche already, after stashing some of our stuff, we were able to hit the trails straight away and walk right out of the tiny town, still groggy from our 33 hours on the bus. We left with our new friend Mark leading the way, but it wasn’t long before he was fanging it along ahead of us and we were on our own. The first hike we did was four days and we went along the main tourist tracks. Our first camp was Lago Torres, fed by the waters melting off the glacier Grande which we could see winding down from beneath the three huge spires. Although it was quite cold, especially when the wind was blowing, it was not nearly as cold as we were expecting, and we didn’t ever have to use all of our many layers. The water running in the steams and rivers is icy cold however, not really surprising since a lot of it has just melted off a huge block of ice. Our second camp, where we spent two nights, was Camp Poincenot, just below the huge Cerro Fitz-Roy. We did several little excursions from here, and the scenery was absolutely stunning. Lago Los Tres was especially beautiful. A still lake, perched way up on one of the foot hills, with Fits-Roy still looming high above it. I was constantly amazed and decieved by the scale of things. We would walk up hills that looked to be just underneath the mountain, only to arrive at the top to see the mountain was even bigger and more looming than before. We were very lucky in that the weather, normally very windy and rainy, was unusually good and we had clear skies most of the time. This inspired me to get up in the cold with my camera for sunrise every morning and the early sun lighting up the yellow, sometimes red rock was really special. On the last morning I was even able to persuade Sophie to get up in the dark and climb the arduous path up the Laguna Los Tres for the sunrise. After roughing it for four days we returned to town for a night in town on a soft bed, content that we had seen most of the major sights and ready to catch a bus onwards to El Calafate the next day. 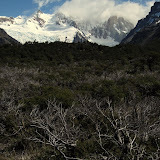 Laguna Torre, Laguna Sucia, Laguna Los Tres and back. 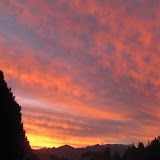 We left Bariloche at 9pm with a most amazing red sunset. Our epic bus trip took us down Ruta 40 which runs down Argentina from the Lakes district in the north all the way down to Calafate in the far South. Though it is more direct, time-wise it is the longer of to routes, the other being Ruta 3, which arrives via Rio Gallegos. This is due to the fact that there are large sections of the road that are unsealed, requiring the bus to crawl along at what seemed to be about 30km/h. So, for one long night, one long day and then another long night we sat in our seats watching the endless plains go by. It was a long trip, but there were some interesting sights to see along the way, including quite a few of what I think were guanacos grazing by the road (llama like things) and some mini-ostrich/emu type birds that I have not yet been able to put a name to. In addition there was some amazing mirages shimmering above the horizon, snow capped mountain ranges and tree covered hills that evaporated as we went by. Equally amazing were some of the real landscapes that we passed. As is often the case when cooped up with a small group of people for extended periods, we made friends with a few interesting characters, including a guy from Perth, Mark Sheen, who is a professional mountain climber and was able to entertain us with stories like what its is like to watch the sunrise on the top of Mt. Everest. We were also able to get a tip or two about how to handle the cold. So in the end, between chatting to passengers, watching the scenery and listening to our Spanish lessons, the trip didn’t drag on too long and before we knew it we were getting off the bus at 7am in El Chalten and preparing to walk into the mountains, still groggy from the bus trip. The long bus trip from Bariloche to El Chalten. Tonight we leave on a huge bus trip, lasting a night, a day and another night, it will take us from Bariloche to El Chalten, way down in the south of Argentina. It will be a killer, but El Chalten sits in Los Glaciars National Park and is said to be the hiking capital of Argentina, full of incredible granite spires and glaciers. It is very far south so is likely to be quite extreme. I am very excited. After hiking a few days there, we plan to go down to El Calafate, and then across to Chile where there is another amazing Park, Torres del Paine. Pray the weather is kind to us down there! At this stage, having spent quite a lot of time in the lakes area, we had decided to move on to see some different scenery. So despite Bariloche being very beautiful, clinging to the hills on the shores of the huge Lago Huepi and surrounded by towering mountains, we booked our ticket onwards for the next night. We had one night there though, and it proved to be interesting. A few minutes before our bus left, on pilfered internet, we had hastily booked a couple of beds in a hostel in Bariloche as it is very busy at this time of year. We arrived at 5pm to find out that our booking had not been registered yet and they were full that night. It could have been quite bad, but the hostel, Ponto Sur, really ran around for us, and in the end the owner of the hostel offered us his spare apartment, all to ourselves and right by the bus station. He even picked us up and took us there. So we spent the night in an apartment with two rooms, kitchen and bathroom all to ourselves, for the price of our 10% booking deposit. Go Ponto Sur! 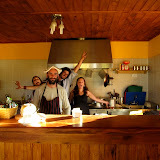 Villa la Angostura is a small touristy town and is the end of the Seven Lakes route. It is set between two lakes and amonsgt the moutains and I´m sure it would normally be a very beautiful town. However, our stay there of three nights was wet and cold. Luckily, soon after we got there we were in the shops and Sophie finally convinced me to shell out for a proper waterproof / windproof jacket. It is made out of pure GORE-TEX®©, apparently a substance that costs more than its weight in gold. It has worked very well though and saved me from being very wet in Angostura where it rained constantly. Some of the attractions we might have seen if it had not been so miserable, the shortest river in the world, and the Bosque de Arrayes, a forest where Walt Disney is said to have gotten his inspiration for Bambi. The one upside of our visit to Villa La Angostura was that, after our first night in a backpackers, we were ablt to contact a friend of Alejandro (who we met in Buenos Aires) who live their with her mum and rents out their spare room. The next two nights we stayed with them in their lovely rustic wooden house tucked in the back of an amazing jungle of a garden. It was awesome to stay with locals and we shared a couple of meals, a good few rounds of Yerba Mate and some delicious local beers from El Bolson. We after waiting for a couple nights for the weather to clear up, we decided that, like in San Martin, we had to just forge onward. 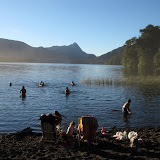 So we jumped on a bus to Bariloche, and like in San Martin, we arrived in Bariloche under clearing afternoon skies. Starting from the previous lake the road turns nasty. Untarred and very dusty, it winds along some very steep mountainsides and valleys with a lot of crazy contruction work happening along the way. The views from the bus were nice however. When we arrived at Lago Espejo (Mirror Lake) our bags were coated with white dust, as was our campsite, as it was right at the base of a steep section of road. It was also quite crowded. It had been a hectic days travel and we weren’t really up to trekking along the beach to find another stealth campsite so we set up there anyway. Needless to say this lake was also stunningly beautiful. We had an early night, listening to a bit of the awesome Spanish music we have acquired from various people. In the morning I was up again for sunrise, it wasn’t quite as cold this time. The sunrise was magic, and I returned to camp to find Sophie up and making us some delicious oats porridge with dates, now our staple for camping in cold places. Just before our bus we were able to fit in a quick walk to Lago Corentoso, another nearby lake, plus the customary skinny dip. Then we found ourselves at the end of the Seven Lakes Road, on a bus to Villa La Angostura. On of the last lakes on the seven lakes route before reaching the end at Villa La Angostura. Adventures of Dean and Sophie is powered by	WordPress 2.8.5 and delivered to you in 0.292 seconds using 41 queries.